Maybe that's not exactly a thing, but the other day sure seemed like it! The wind was blasting, it was crazy!! These pictures sort of speak for themselves and the wind! My hair was everywhere in almost all the pictures, so I didn't get to have too many shots hopefully these are enough haha! Oh lala, my first ever giveaway on Plated Pearls! And it's a great one at that! Rosegal is a growing, global online retailer stock full of incredibly beautiful pieces at even more incredible prices! They have a ton of gorgeous vintage and chic items that would most likely suit anyone's fancy! So, go on and check out Rosegal :)!! A winner will be randomly chosen on the 6th of December and receive a 25$ credit to Rosegal. Good luck and happy hunting!!! You made your first ever purchase from ASOS? Wow! ;) I love those Zara boots on you, such a cute Autumnal look. and that fuchsia color really suits you! Stunning - I love the boots! Okay, that purple color is stunning on you. Looks great for your skin tone and makes your hair look lustrous! and your outfit looks so classy, I especially like the Zara boots. haha great! don't they have such great things?! Love this look and ofc your blog! First of all, I love the outfit you are wearing- looks absolutely perfect for fall, that purple blouse must be my favorite! And second of all, such a cool giveaway! 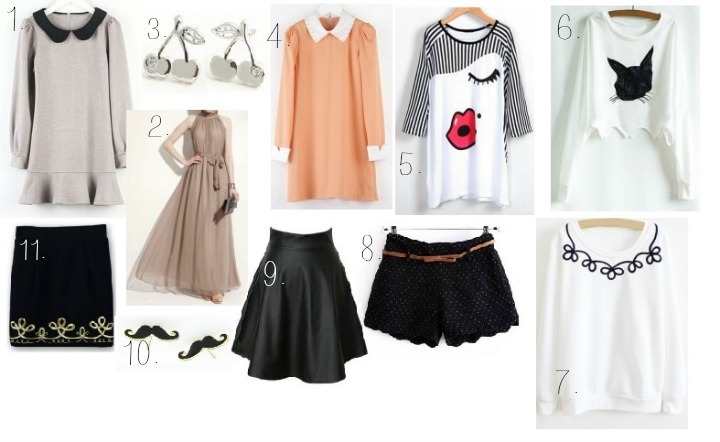 My favorite piece spot on must be that black leather skirt (nr 9)! Ouu, you look amazing in this shade of purple! That top is so pretty too, love the detailing. Love the colour of your top and your boots!! Beautiful pictures and great giveaway. I adore the purple shirt and those shoes. The feeling you give me is the beauty of a classical girl. Love the all of your pics! Love the color of your top. You look so pretty in this outfit. Oh wow! You are gorgeous <3 The maroon top is so beautiful! I love the print and lace sleeves! Fantastic boots, also! Beautiful look overall! Thanks so much for the sweet comment you left on my blog! After taking a look around yours, I have to say, I love your sense of style. ^_^ I look forward to following you on Bloglovin'! I love ASOS, they have the most amazing pieces. Will have to check out Rosegal too. by the way, thanks for stopping by my blog! I'm following you now. I absolutely love http://www.rosegal.com/dresses/casual-style-scoop-neck-openwork-53613.html this dress. It's so stunning and so affordable! I'm a new follower and thank you for the chance for this giveaway. I follow Rosegal on FB as Joanna Ladesma.